On the base of advantages in gene geography and anthropophenetics the phenogeographical method for anthropological research is initiated and experienced using dental data. Statistical and cartographical analyses are provided for 498 living Eurasian populations. Mapping principal components supplied evidence for the phene pool structure in Eurasian populations and for reconstructions of our species history on the continent. The longitudinal variability seems to be the most important regularity revealed by principal components analysis (PCA) and mapping proving the division of the whole area into western and eastern main provinces. So, the most ancient scenario in the history of Eurasian populations was developing from two perspective different groups: western group related to ancient populations of West Asia and the eastern one rooted by ancestry in South and/or East Asia. In spite of the enormous territory and the revealed divergence the populations of the continent have undergone wide scale and intensive time-space interaction. Many details in the revealed landscapes could be backgrounded to different historical events. The most amazing results are obtained for proving migrations and assimilation as two essential phenomena in Eurasian history: the wide spread of the western combination through the whole continent till the Pacific coastline and the envision of the movement of the paradox combinations of eastern and western markers from South or Central Asia to the east and to the west. Taking into account that no additional eastern combinations in the total variation in Asian groups have been found but mixed or western markers’ sets and that eastern dental characteristics are traced in Asia since Homo erectus, the assumption is made in favour of the hetero-level assimilation in the Eastern province and of net-like evolution of our species. Odontology is a subdiscipline of physical anthropology with a special swagger. With a strong genetic basis, functional independence of traits, their evolutionary stability, clear geographic patterning and easy comparability of ancient and modern samples, odontology can give evolutionary craniology and even population genetics a run for their money. I remember in 2003, at the Memorial Joseph Greenberg Conference in Stanford University, Christie Turner, the patriarch of American evolutionary odontology, in a lounge discussion, prided on the stability of dental traits compared to “Cavalli’s neutral genes,” which in his opinion spread around and mixed-and-matched in the last 20,000 years. Many odontologists believe that dental patterns reflect ancient population processes better than evolutionary craniology. Including Suggestions about East Asian Microevolution, Population History, and Late Pleistocene Relationships with Australian Aboriginals,” American Journal of Physical Anthropology 82: 295-318, 1990) claims that 8 traits (upper central incisor shoveling, upper central incisor double shoveling, single rooted first premolars, enamel extensions of the first maxillary molar, peg-shaped/reduced third maxillary molar, three-rooted mandibular first molar, deflecting wrinkle of the first mandibular molar, and four-cusped second mandibular molars) effectively discriminate Sinodonty from Sundadonty. He classified all of Amerindian (including Paleoindian) and East Asian dentition as Sinodonty and all of Southeast Asian, Veddas of Sri Lanka, Polynesian and Micronesian dentition (including Negritos) as Sundadonty. 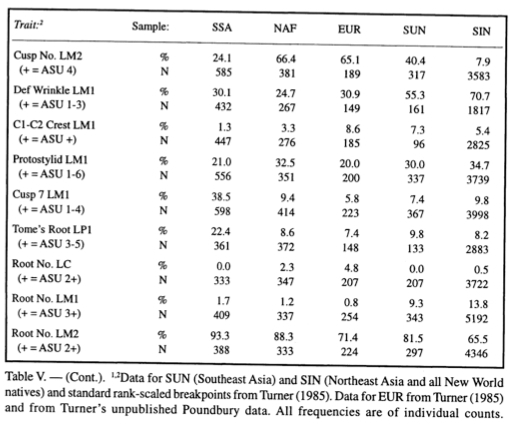 The two types corresponded to broader craniological categories of “Northern Mongoloids” and “Southern Mongoloids.” Turner considered Sundadonty the most neutral type worldwide and, consequently, he argued for a Southeast Asian origin of modern humans. The Sundadonty type evolved into Sinodonty via trait specialization, while Sundadonty evolved into African and European dentition via trait simplification. This simplification and gracialization trend has affected European dentition the most – with the exception of Carabelli’s trait, there are no unique, mass-additive traits that are found at high frequency in Europe and at moderate-to-low frequency elsewhere. (Two-rooted lower canine is another European-specific marker of recent origin and low frequencies in Europe that is found in East Asia due to recent gene flow from Europe, see Lee, C., and R. G. Scott. 2011. “Two-Rooted Lower Canines—A European Trait and Sensitive Indicator of Admixture Across Eurasia,” American Journal of Physical Anthropology 146 (3): 481-485). That’s why European dentition is usually characterized by what it is not, rather than by what it is. Turner joined the triune alliance of genetics, linguistics and anthropology to argue for a three-wave model for the peopling of the New World (Greenberg, J. H., C. G. Turner, and S. L. Zegura. 1985. “Convergence of Evidence for Peopling of the Americas,” Collegium antropologicum 9: 33-42; Greenberg, J. H., C. G. Turner, and S. L. Zegura. 1986.”The Settlement of the Americas: A Comparison of the Linguistic, Dental, and Genetic Evidence,” Current Anthropology 27 (5), 477-497). Turner did not analyze African dental patterns as systematically as he analyzed Asian dentition. It was obvious to him, however, that African and Amerindian dentition were very far apart and if there were any pre-Columbian contacts between Africa and the New World (as hypothesized by Ivan van Sertima) they would have been easily discernible (Turner, C. G. 1990. “Dentition is Unsupportive of Prehistoric African Contact with American Indians,” in Para Conocer al Hombre: Homenaje a Santiago Genovés a 33 Años como Investigador en la UNAM. Pp. 249-252. Mexico: UNAM). It took Irish to devote a Ph.D. dissertation (“Biological Affinities of Late Pleistocene through Modern African Aboriginal Populations: The Dental Evidence,” Arizona State University, 1993) to circumscribing the Afridonty, or the “Sub-Saharan African Dental Complex.” He found (“Ancestral Dental Traits in Recent Sub-Saharan Africans and the Origins of Modern Humans,” Journal of Human Evolution 34, 1998, 81-98) that Sub-Saharan Africans are the least derived among modern human populations compared to a sample of archaic hominins and non-human primates. Afridonty tend to show contrasting frequencies in many of the key non-metric traits with Sinodonty (see below, from Irish, J. D. 1998. “Dental Morphological Affinities of Late Pleistocene through Recent Sub-Saharan and North African Peoples,” Bulletins et Mémoires de la Société d’Anthropologie de Paris 10 (3), 237-272). “The Sub-Saharan Africans are least like Sinodonts despite the fact that both groups have morphologically complex, mass-additive teeth relative to other human populations. Indeed the two appear to be at opposite ends of a dental morphological spectrum for many traits” (Irish 1998, 255). The Japanese school of odontology has been focused on understanding dental variation in Asia, with a special focus on the origin of Japanese. Kazuro Hanihara, Hirofumi Matsumura and others have viewed the history of Japan and Southeast Asia through the lens of an epochal process of admixture between aboriginal non-Mongoloid populations (e.g., Ainu in Japan) and the Mongoloid migrants of Holocene origin. Hanihara (“Mongoloid Dental Complex in the Permanent Dentition,” in Proceedings of the VIIIth International Symposium of Anthropological and Ethnological Sciences. Tokyo: Science Council of Japan; September 3-10, 1968, 298-300) was the first one to delineate the “Mongoloid Dental Complex” that inspired Turner to develop the Sinodonty-Sunadonty theory. Matsumura (Matsumura, H., and M. J. Hudson. 2005. “Dental Perspectives on the Population History of Southeast Asia,” Am J Phys Anthrop 127 (2), 182-209) dismissed Turner’s Sundadonty type as an artifact of admixture between in-situ Australo-Melanesians and the Sinodonty who expanded from the Northeast Asia into Southeast Asia. At the same time, American physical anthropologists such as Powell, Sutter and Rebecca Haydenbilt showed that Paleoindian dentition (especially in South and Central America) exhibited Sundadonty and not Sinodonty traits, which, in the light of Matsumura critique of the Sundadonty taxon, should be interpreted as Australo-Melanesian traits. Instead of Turner’s somewhat “boxy” division of “Eastern” dentition into Sinodonty and Sundadonty, the data from ancient and modern populations is more consistent with a pattern whereby there is a crossover between Asia and America in the distribution of both Sinodonty and Australo-Melanesian traits, as illustrated by Fig. 5 in Sutter’s “Prehistoric Peopling of South America as Inferred from Epigenetic Dental Traits,” Andean Past 7 (2005), 215, see below). 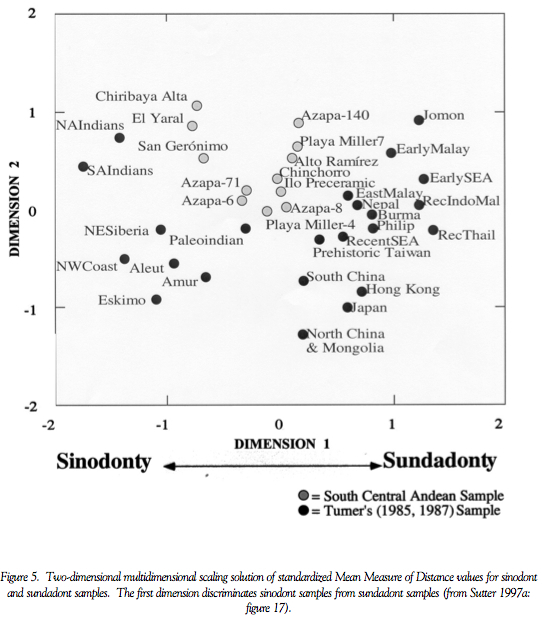 Notably, in both Asia and America, younger and more northerly samples show higher frequencies of Sinodonty traits, but from Sutter’s Fig. 5 it appears that Turner’s Northeast Siberian and Amurian samples (on the left) are nested among Amerindian samples, which is consistent with a back migration of Amerindians to Siberia at the end of the last Ice Age (out-of-America III). This is consistent with the larger argument advanced by Walter Neves, Joseph F. Powell and others (See, e.g., J. F. Powell and W. A. Neves. 1999. “Craniofacial Morphology of the First Americans: Pattern and Process in the Peopling of the New World, ” Yearbook of Physical Anthropology 42, 153-188) that Paleoindian crania resemble Australo-Melanesian and not Mongoloid morphology. The Russian-Soviet school of odontology is headlined by Alexander Zubov (his last name, comically, means “tooth”), from the premiere center of anthropological research in Russia, the Institute of Ethnography in Moscow. This school’s main geographical focus has been Eurasia and, by extension, the New World, as the latter is assumed to have been colonized from Siberia. Zubov was partial toward an early (pre-Clovis) entry of modern humans into the New World, and his extensive Russian paper entitled “Bioanthropological Characteristics of the Indigenous, Pre-European Population of America” (Зубов А. А. Биолого-антропологическая характеристика коренного доевропейского населения Америки // Население Нового Света: проблемы формирования и социокультурного развития. Сборник статей. М.: ИЭА РАН, 1999) gave a balanced account of the evidence. Zubov questioned Turner’s assignment of all American Indians to the Sinodonty type because among some Central and South American tribes the frequencies of the most diagnostic Sinodonty trait, shovel-shaped incisors, were much lower than among the true Sinodonty, the North American Indians (Kekchi Maya 33,9% Goajiro 36,5%). Zubov’s interpretation of the dental material from the Americas led him to believe that the New World was colonized by an undifferentiated “Mongolo-Australoid” population. Kashibadze et al. (2011) is a rare paper coming out of the Russian school of odontology that is available in English. 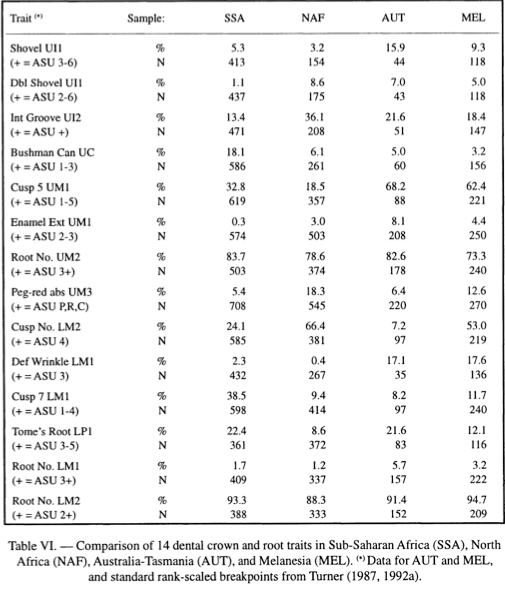 The paper is not globally comprehensive (America is not represented and Africa is represented by populations from Mali and Ethiopia) and operates with a limited set of 8 dental traits (see below, Table 1; comparative data for the other 24 traits from Zubov’s survey program is too fragmentary) but it does deal with continental Eurasia – an important breakpoint zone between the Sinodonty and Afridonty areas of distribution. Kashibadze et al. 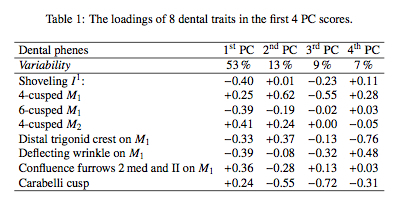 (2011) ran Principal Component Analysis (PCA) against the 8 traits and arrived at the conclusion that PC1 explained by far the largest proportion of dental variation. PC1 reflects the most ancient demographic and geographic split in their dataset. They further note that this division is older than the age of Homo sapiens sapiens. 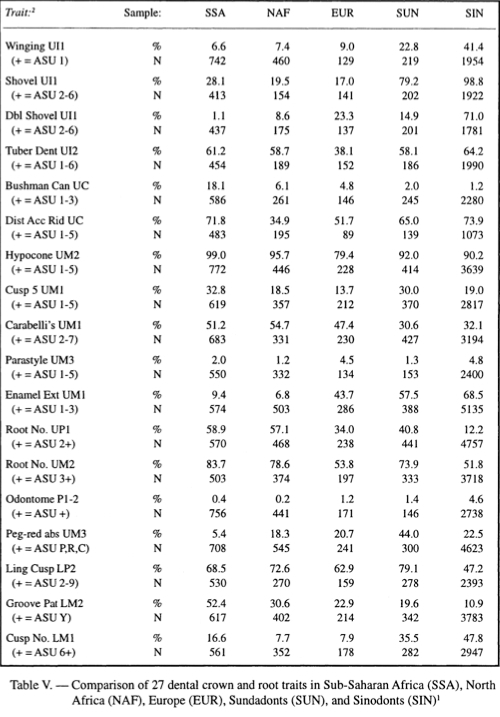 Indeed, LM1 in the above Table V from Irish 1998 shows world-highest 48% in Sinodonty. But for LM2 Irish’s data is more ambiguous. Sub-Saharan Africans and Australians have definitely lower frequencies of this trait than other populations but then it’s North Africans, Sundadonty and Melanesians have the highest frequencies, with North Africans being the richest in this trait. But when it comes to shovel-shaped incisors, the dental trait prominent in both Neandertals and Asian Homo erectus, their data is more clear-cut: ancient samples from West Eurasia, at least from the Bronze Age on in the Caucasus, show higher frequencies of shoveling – more in line with its frequencies in the “eastern province” (see below, from Kashibadze, The Caucasus in the Anthropological Space of Eurasia. Ph.D. dissertation, 2007, in Russian). As I blogged before, higher frequencies of shoveling compared to modern West Eurasian populations have also been reported from Gravettian samples and from Catalhoyuk. 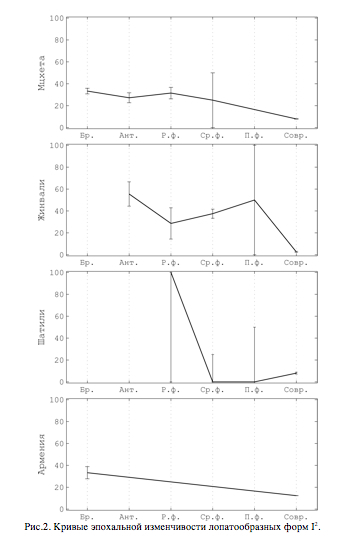 Although Kashibadze et al.’s (2011) do not deal with Africa and Irish’s Afrodonty does not highlight any dental specificity of South African Khoisan, it is worth pointing out that Khoisan dentition is more mass-additive and shows higher frequencies of shoveling and five-cusp UM than neighboring Bantu speakers (Haeussler, A. M., J. D. Irish, D. H. Morris, and C. G. Turner. 1989. “Morphological and Metrical comparison of San and Central Sotho Dentitions from Southern Africa,” American Journal of Physical Anthropology 78 (1), 115-122), which likely reflects different evolutionary histories of the two groups, and contributes to other Khoisan-specific phenotypical traits (such as epicanthic fold and lighter skin) linking Khoisan to Eurasia to the exclusion of other Africans. While the above determinations appear to support my multiple migration scenario, I have some trouble with the methodology – defining groups based upon trait frequencies. Thank you Gisele. I wasn’t aware of Sutter’s 2005 paper, although I have his earlier dissertation. The post didn’t mean to go as deep as necessary into the issues with New World dentition, although as I was writing it it progressively became very New World focused, but without the level of detail that you contributed. I know Haydenbilt’s work, too, although I don’t know of any publications with her and Marta Lahr as co-authors with the exception of an abstract from AAPhA meetings. I can see your point about multiple migrations, but it runs into a difficult issue of explaining the fact that genetically, culturally and linguistically all Native Americans (including Eskimo-Aleuts) are fundamentally “the same.” The difficulty increases with every new migration postulated. Multiple migrations can explain the peculiar diversity of Amerindian populations (especially the thorniest linguistic diversity) but at the expense of leaving similarities unexplained. One migration takes care of the latter but misses the former. Out-of-America resolves these problems quite nicely. Under out-of-America III, for instance, Sinodonty is explained as the evolution of a pre-Sinodonty (mislabelled Sundadonty by Turner, per Matusmura and Hudson’s critique) pattern in the Americas with subsequent spillover into the Old World. Note that in Sutter’s Fig. 5 Northeast Siberians and Amur populations are nested among Amerindian Sinodonty, and this precisely the areas where we find the back-migrated A2 and C1 mtDNA lineages. I’ll update the post slightly to reflect your comment. Would you expand on the following? I still have a problem with two black and white categories – Sinodont and Sundadont. If both “patterns” were present in the New World in pre-Columbian times, then a third category is required or an explanation of how the offspring of the early Sundadonts became Sinodonts. All Native Americans share the same autosomal component in all admixture runs, including Reich’s recent one. All New World mtDNA clusters into a very specific set of haplogroups – A2, D, B2, C1, X2. They are found over wide territories, across language boundaries no matter how “long-ranging” they are, and most of the time in both North and South America. Classical markers show world-highest frequencies of blood group O and a specific subset of them is New World specific and again found virtually everywhere. The same can be said of a few other genetic markers that are not as widely popularized in genetic literature. Culturally, all Native American kinship systems (including Eskimo-Aleuts and Na-Dene) share some structural features that are rare elsewhere (but, as I argue, ancestral to those of the Old World), the same mythological motifs are found among Eskimo-Aleuts and in Amazonia (http://anthropogenesis.kinshipstudies.org/2012/08/comparative-mythology-and-the-study-of-modern-human-origins/). Linguistically, Native American languages widely share the same set of structural features frequent in the New World but rare elsewhere (http://anthropogenesis.kinshipstudies.org/2012/03/american-indian-uniqueness-linguistics-and-genetics/). Polysynthesis and head-marking are the most famous aspects of Native American languages that are pervasive in the New World and rare in the Old World. A recent paper seems to confirm the pattern (http://anthropogenesis.kinshipstudies.org/2012/09/stability-vs-diversity-a-novel-method-for-analyzing-worldwide-linguistic-structures/). There’s a geographic substructure behind these features, with Circumpacific Amerindian languages contrasted with “eastern” languages and the Northern cluster of mythological motif contrasting with the Southern cluster, but the underlying pattern is clear and the very fact that depending on the cultural system traits will cluster along different axes speaks to the likelihood that these are secondary clusters on top of what fundamentally is the same population. One could explain it as a pervasive contact phenomenon but this kind of pervasive and in-depth sharing presupposes a very lengthy reshuffling process (again suggesting great antiquity of autochthonous evolution in the Americas), the specifics of which will be forever unfalsifiable. I’m not a fan of categorical labels such as Sinodonty, but they are handy and if one knows the underlying frequency distributions of the traits they can work for the time being. But I agree with you that they are imperfect and Matsumura and Hudson’s critique of Turner was directed precisely at that. I think it wouldn’t be wrong to say that there are two most distinctive types out there (Sinodonty and Afrodonty), with everything else in-between. How did they emerged is a $100 question. Sorry for continuing to stray OT… With regards to Reich et al. (2012) – at present, autosomal DNA seems to be best for identifying recent admixture. I note that there have been almost *no attempts* to trace Native Americans back to one or more regions of East Asia. When it is possible to do that, then researchers will be more likely to see which components do not fit their models. I could not find the word “random” in Reich’s article. If the SNPs were selected or determined via filtering, this would affect the outcome of the results. Figure 4 of their article illustrates the difference between random and selected SNPs. Again, these autosomal DNA studies feel very preliminary. You’re welcome to stay off topic. I agree with you that autosomes are late-bloomers among genetic systems, but the pattern seems to make sense in the light of the other evidence. I don’t mean to underestimate your caution, which is valid because of the constant danger of an ascertainment bias, just am looking at a bigger picture. Thanks for the Kidd paper. Interestingly, their structure analysis using Random SNPs – a better tool to infer evolutionary relationships – confirms Amerindian admixture in Eurasia all the way to the Danes in the west. While High In SNPs and haplotypes don’t. German, thanks for posting a link to this over on AnthroScape. Is a very interesting post, but normally the evidence of Sundadonts in the Americas is hidding (for sinodont police??). Please read this article for discussion using Northern Andes pre-Hispanic samples. A very complete research about Sundadonts in the Americas come soon in an article and a book (in spanish I hope).